Without fail every day my boys need clothes and food. (Oh, and love & attention, of course). Meeting their needs is a challenge on your average day. But what about the days when my mind and heart are otherwise occupied? You see as my children get older, so do my parents. And with my parent’s age comes health issues. With health issues sometimes my brain is filled with concerns turned into prayers. I’ve noticed some of my friends a little ahead of me are living out the “sandwich” years. A term describing the balance of caring for their own children while helping care for their parents. In the past year I’ve had three friends lose a parent suddenly. But how does a mom make room in the dailiness to grieve? And how do I as a friend best help comfort and support that mom? Today’s podcast guest is my soul sister friend, Stacey Thacker. She and I have been chatting about life, Jesus and family for the past 3 years. I’m excited to share her with y’all. Stacey writes online and has co-authored the book, “Hope for the Weary Mom” with Brooke McGlothlin. This last year Stacey has taught me so much about how to help friends who are grieving. So I invited her to share her story. 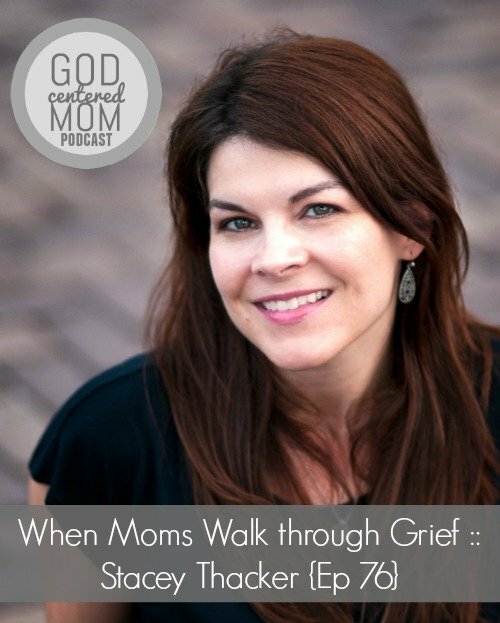 Such great information on grief, both for ourselves and how to walk through it with friends! Oh my goodness…can’t wait to listen to this podcast! I am 33 with a 1.5 old daughter and putting my Dad in a nursing home who doesn’t want to be there. This couldn’t be the more perfect podcast! I wish I would have found it sooner, but found it and still in the midst of it.